One of our major projects of 2014 – 2015, 40M Utility Vessel was successfully delivered to Fiji Government on July 2015. 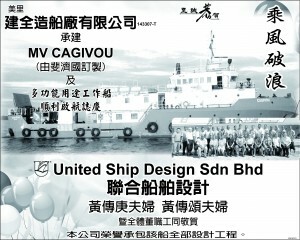 Delivered in July, 2015, “CAGIVOU” is one of the designs from United Ship Design, Sibu, Malaysia, constructed by Kian Juan Dockyard Sdn Bhd, Miri, Malaysia. 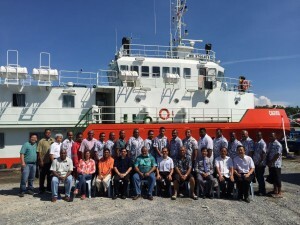 It is the third vessel which was delivered by Sarawak Shipbuilders to Fiji Government. The launching ceremony were also witnessed by Permanent Secretary for the Ministry of Infrastructure and Transport of the Government of Fiji, Commander Francis Kean, Managing Director of Kian Juan Dockyard Sdn Bhd, Mr. Lim Chee Leong, Managing Director, Mr. Wong Tuong Keng of United Ship Design Sdn Bhd and some more Media. 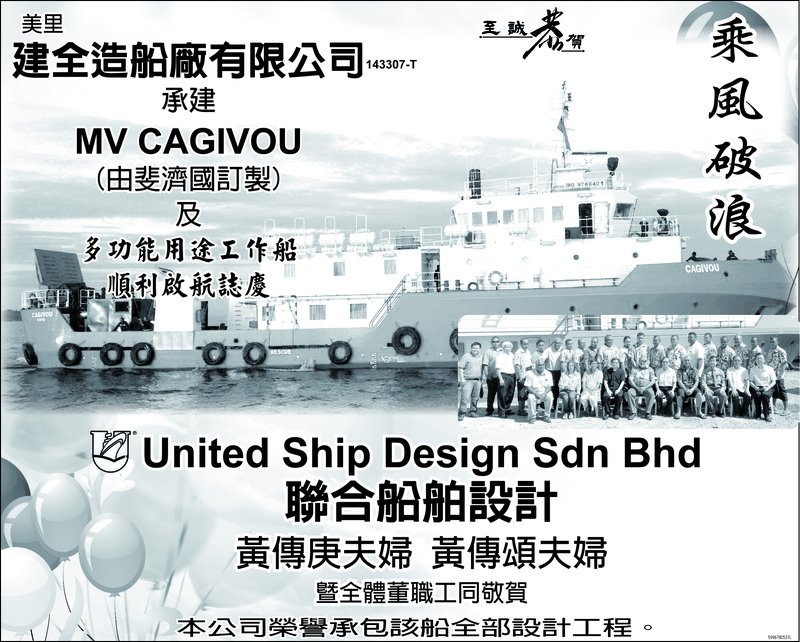 Other recently delivered to Fiji Government, like Sigavou and Vunilagi (both are 45M Landing Craft) were also designed by United Ship Design Sdn Bhd. They were built in 2014 from Sibu. With an overall length of 40 metres on a breadth of 11m, the vessel has a depth at sides of 3.8m and a design draft of 3.2m. Classified by ClassNK, which notation is NS*(UV), MNS*. “CAGIVOU” has twin Cummins KTA19-M3 main engines powering a fixed propeller with Reintjes WAF364L. A pair of 80 kW generator sets provide auxiliary power. On sea trials the vessel achieved a speed of 12 knots. And the overall performance was found satisfactory by all parties. “CAGIVOU” will be used as transportation in development projects such as building of schools, hospitals as well as transporting people in the rural part of the country.